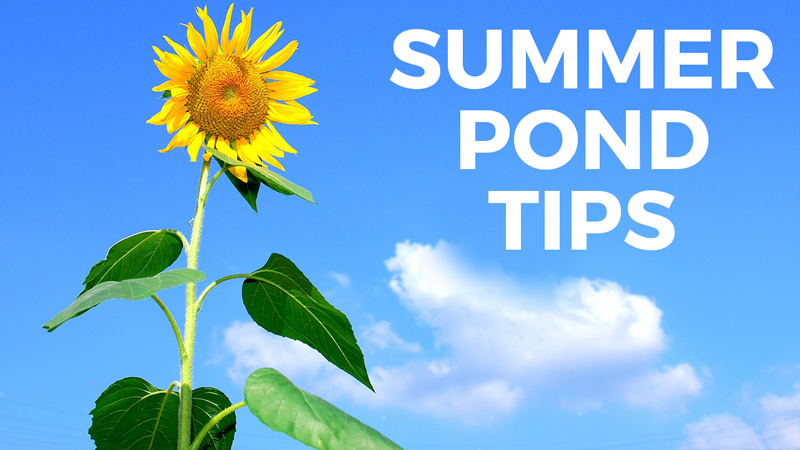 SUMMER MAINTENANCE TIPS Keeping a healthy clean pond during the summer months can be easy - with just some general light maintenance. Let's jump right in and review these easy steps. Keeping a healthy, clean pond during the summer months can be easy - with just some general light maintenance. Let’s jump right in and review these easy steps. Add Beneficial Bacteria- Doing so will build up the nitrifiers. It also improves dissolved oxygen levels while helping to breakdown fish waste, uneaten fish food, sludge and other organics. All these do contribute in feeding algae blooms. So, it’s good to tie up those loose organics with bacteria. Monitor Algae Treatments - If you do end up with an algae bloom, like most of us do, make sure to use a product that is appropriate to the size of your pond and the specific application. And watch for products that can be harmful to snails. Make sure circulation is continuous and add additional aeration if possible when using any type of algaecide. Temperature and plants are important. Your pond should have about 50% plant surface coverage for shade. Prune dead plant material and direct fertilize once a month. Doing so will provide an overall more healthier plant. Overfeeding Your Fish- Overfeeding can cause big issues. Uneaten food and the excess fish waste will ultimately increase the organic muck buildup on the pond bottom. Which will cloud the water and is also what algae love to eat. This debris can also directly affect the ammonia levels. These simply steps should help ensure a more stress-free summer after that lengthy spring start up. For additional seasonal pond tips, please don’t hesitate to call. I’m Joe from webbsonline.